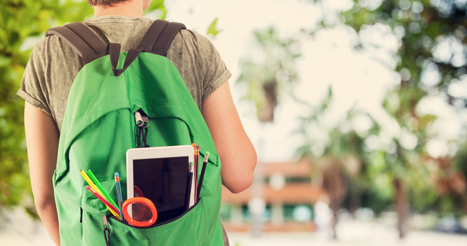 Does a student have a reasonable expectation of privacy when he leaves a backpack behind? Is the school behaving reasonably when personnel open an unattended backpack? School personnel must often balance a student’s right to privacy with a school’s interest in protecting all students. A recent decision by the Ohio Supreme Court brings to light the complexity of these competing concerns and the high-stakes decisions that must be made in the fast pace of a public school. The case began when a Columbus Public Schools bus driver found a backpack in the bus at the end of his route and gave it to the school security officer. He opened the bag and found a paper with Polk (the student)’s name on it. Upon seeing the name, he recalled a rumor that Polk was in a gang. He took the bag to the high school principal. Together, they emptied the backpack and found bullets. They then summoned a police officer, and the trio went together to find the student. They detained Polk and searched another bag he was carrying. That search revealed a handgun. Polk was charged with possession of a deadly weapon in a school zone. In the criminal action, Polk filed a motion to suppress the evidence of the gun and the bullets, arguing that the search of both bags was unreasonable and thus unconstitutional under the Fourth Amendment. An Ohio trial court and the Ohio Court of Appeals ruled in Polk’s favor. They looked at the situation as three separate searches — the school security officer’s initial search of the backpack; the second search of the same bag by the security officer and the principal, and the search of the second backpack that yielded the handgun. The lower courts held the initial search of the unattended bag was justified. But the more intrusive second search of the bag, which was based on rumors of gang membership, was not reasonable. The third search was also unreasonable since it was based only on the discovery of the bullets, which had been found through an unconstitutional search of the first bag. But the Ohio Supreme Court disagreed in Ohio v. Polk (2017). The court noted that the high school’s practice was to search unattended bags to determine ownership and to see if they presented any danger. This practice was within the school’s interest in protecting students. Since the security officer had not completed the initial search sufficiently to actually tell if there was anything dangerous in the backpack, a second, more thorough search was warranted. No additional information was necessary to justify a thorough search of the unattended backpack. The more thorough search of the first backpack yielded the bullets, which provided sufficient evidence to find the student and search the second bag. Thus, the court found the searches to be reasonable. Confusing? Yes, especially when you are the school administrator who is making decisions under pressure. Let’s look at them step by step. The general rules regarding school searches are derived from federal constitutional law. Some states have provided students greater protection than that provided by federal law. Under the Fourth Amendment, a search is an invasion of someone’s reasonable expectation of privacy. Whether the individual owns, borrows, or leases the property searched, what matters is that he or she has a reasonable expectation of privacy relative to that property. For example, students have an expectation of privacy in their lockers, backpacks, their personal items, their clothes, and their bodies. That expectation of privacy may be extremely low, but it still exists. However, if items are in “plain view” or abandoned, no search has taken place because the person has shown no expectation of privacy. In this situation, if the bag had been abandoned, Polk would have given up his expectation of privacy regarding it. But the bag had been left (we assume forgotten) on the bus. If the bag were just lost, Polk still would have an expectation of privacy regarding the bag, but that would have been limited by an official’s need to open the bag to determine its owner. When can students and their possessions be searched? Public school students’ privacy rights in schools are not equivalent to those of adults. The school has more latitude in searching students than do police in searching people. Generally, police can search a person only when there is probable cause or sufficient exigent circumstances to reduce this requirement. However, the U.S. Supreme Court has said a school’s obligation to teach and protect students within the school requires the “probable cause” standard to be diluted to one of “reasonable under the circumstances.” New Jersey v. T.L.O., 469 U.S. 325 (1985). To determine if a search is reasonable requires balancing the student’s privacy interests against the school’s interest. Under this standard, schools may conduct reasonable searches of students and their belongings. The reasonableness of a search depends on the need and purpose of the search, the degree of certainty that something will be found, as well as the extent to which the search will infringe on the student’s expectation of privacy. The lower the expectation of privacy, the less certainty required to make a search reasonable; the higher the need for the search, the less certainty required to make a search reasonable. Reasonableness also requires a search of only those places where the item sought could actually exist. Anything found during a reasonable search is fair game. Any evidence of wrongdoing found during a reasonable search also can be used as evidence against the student. And evidence found during a search can be used to justify a further search. For example, evidence of drug use found during a search for cigarettes in a purse would justify a more intrusive search. Or bullets found in a backpack would justify the search of the person and their belongings for other dangerous items. To determine if a search is reasonable, you must consider all of the circumstances and the degree of intrusiveness of the search. This requires balancing the student’s privacy interests against the school’s interest. The greater the interest of the school, the greater the intrusion into a student’s privacy will be allowed. Here the school security officer failed to fully investigate the bag when it was first given to him. Did his actions indicate that the school was not concerned about the possibility of danger? Is there a need to fully search every bag left on the bus or in the hallway immediately when it is found? It seems that the Ohio Supreme Court gave the benefit of the doubt to the school in concluding that the more thorough search of the first bag was reasonable. In doing so, they focused on the threat of violence in schools and the incidents of school shootings in the U.S., stating that schools have a “compelling interest [to ensure] that unattended book bags do not contain dangerous items.” Concluding that the search for dangerous items had not been completed until the second search, they found it to be reasonable. Since the search of the second bag was based on information found in a reasonable search, it, too, was reasonable. In this day and age, we have become attuned to the danger of unattended bags. It has become status quo to seize and open unattended bags at airports, stadiums, and malls across the United States to determine if they are safe. It would seem reasonable to expect that if you lose or leave a bag it will be opened not just to identify the owner but to determine if it represents a threat to the general safety. Extending that rationale to the schools, which may experience many unattended bags throughout the day, seems reasonable. Citation: Underwood, J. (2017). The privacy of a student’s backpack. Phi Delta Kappan, 99 (2), 76-77.